← Science Caturday: I can haz caption? UPDATE: A major paper supporting the autoimmunity narcolepsy connection has been retracted, please see my update to this post here. It’s been a pretty rough flu season. While my household has so far been lucky, (knocking on wood all over the house) many were knocked out of commission by this year’s influenza epidemic. Now, it turns out there’s more to be worried about than just catching the flu. A long range result of having the flu or having a flu vaccine can be development of narcolepsy…..What?! Narcolepsy is a neurological condition in which your brain cannot regulate sleep and wake cycles appropriately. Narcoleptics can fall asleep at any time regardless of their current activity. Large-scale genetic studies have shown that narcolepsy has a strong association with mutations in the T cell receptor alpha locus. This surprising link to the immune system led to research that implicates auto-immune malfunction wherein a person’s immune system kills neurons expressing the protein hypocretin which is necessary to regulate wakefulness. So now how is this related to the flu? 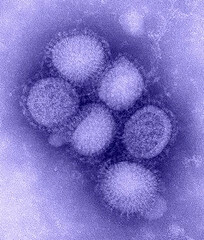 After the H1N1 flu outbreak in 2009 there were new groups of narcoleptics diagnosed approximately 5-7 months after having the flu or receiving a flu shot. A particular batch of vaccine Pandemrix (which used two adjuvants to increase its effectiveness), administered in Europe, was linked with an increased risk of narcolepsy. There is a strong correlation between influenza infection (by natural means or particular vaccine preparations) and an increased risk of narcolepsy. Scientists and physicians don’t yet know exactly why this happens. Not everyone has the same risk level for developing narcolepsy post-infection; genetic susceptibility plays a large role. It’s possible that the antibodies your body makes to combat the flu also happen to recognize and attack the cells expressing hypocretin (and regulating wakefulness). While the immune system is excellent at making specific antibodies for each infection, there is always a possibility that these antibodies may also attack “self” cells. While this may sound like an anti-vaccination storyline, it truly is not. The risk of dying from influenza (which can vary widely year to year, but in the US an average of 36,000 people die each year) is much greater than the risk of developing narcolepsy from the infection or the vaccination. Swedish data shows that Pandemrix vaccination resulted in 3.6 additional narcolepsy cases per 100,000 vaccinated. For perspective, approximately 30 million people were immunized with the Pandemrix vaccine across Europe. If you don’t feel like breaking out the calculator and if the Swedish rate can be extrapolated to the entire population, this would result in approximately 1080 cases of narcolepsy versus about 85,000 deaths (if we extrapolate from the US rate). The use of adjuvants (thought to be responsible for the increased risk of narcolepsy) in flu vaccines is not licensed in the United States. It is much better to be vaccinated and not be sick at all! This entry was posted in Curiosities of Nature, This Mortal Coil and tagged flu, influenza, narcolepsy, Vaccination. Bookmark the permalink. Do you care to place odds on the chance that this is true? I say it’s 1/1000. These studies are just too arbitrary. Basically, they cover very specific populations over very specific time periods. Their samples are often pretty small. I’m thinking “post-hoc” and “publication bias”. It’s probably worthwhile to do an inexpensive follow up study, such as combing through existing medical records to see if the correlation persists across societies and across years. My expectation is that it won’t. I wouldn’t stake my career on it, and I wouldn’t award a grant worth more than $100,000 to do a follow up. These various studies seem to contradict each other. For instance, the CHinese study reports that the onset of narcolepsy has a seasonal pattern. That observation seems to be absent from the Finnish, Swedish, and American studies. Indeed, if that pattern did exist, I think it would be difficult for them to have attributed any effect to the vaccination in 2009 because it would be swamped in the natural variation. All we have is a correlational study showing some (possibly random) difference between kids who got vaccinated and kids who didn’t. How is that evidence that the vaccination caused narcolepsy? Are there no systematic differences between kids who get vaccinated and kids who don’t? We seem to know next to nothing about this disease (e.g. is onset seasonal? ), yet some people are willing to jump to conclusions about its cause based on what is essentially anecdotal data. While I agree that the studies were performed post-hoc, I do think that there is truth in the findings. The data are not necessarily contradictory in that the Chinese study was only focused on natural influenza infection and could therefore infer something about seasonality. The other studies focused more on the vaccine angle and therefore couldn’t make any statements about seasonality. The main point is that something about influenza infection or overactivation of the immune system by a vaccination can possibly contribute to the autoimmune origins of narcolepsy. This research is still in its infancy and I’m looking forward to seeing more definitive data on the topic.